Looking to reach a large audience but not wanting to spend a king's ransom? Bay Weekly classifieds get great mileage, reaching more than 50,000 readers each week in the Chesapeake Corridor stretching from Severna Park to Solomons Island. All classified ads are prepaid. Run 52 weeks and SAVE 45% (standard 20-word ad only $286). Line classifieds also appear free of charge online at www.bayweekly.com/classifieds.html. Guaranteed dispay classifieds offered for any single item include photo and text in a 1 column x 2.5" ad, items under $5,000, $150 and items over $5,000, $250. Display Classifieds ~ Show Them what you have got! Display classifieds boxed with text and graphics don't just tell readers what you have to offer  they show them what you have got! 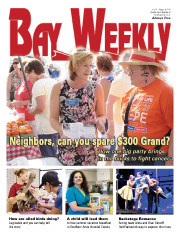 Plus, with Bay Weekly you won't pay extra for our award-winning typesetting and ad design. $18 per column inch (1 col. = 1.521"; 2 col = 3.167"; 3 col = 4.812"; 4 col = 6.458"). Run 52 weeks and SAVE 45% (1-column-inch ad only $514.80).